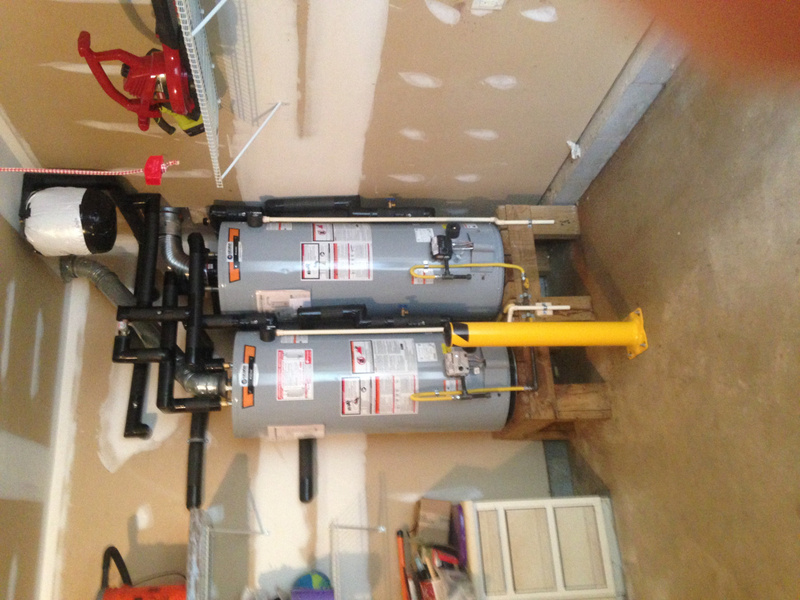 Two 50 gallon Apollo heaters, both serving different hvac units. Developed length of piping for domestic supply was balanced well enough that the heater on the left purged out the open t and p 10 seconds after the right purged. I sold this, total cost was around $8500, myself and another tech finished it in a day. I still don't understand posting pictures on this forum, the picture is right side up on my desktop, and when I upload it, I see no way to right it. OpenSights and MACPLUMB777 like this. This is only based on my experience so it may not work for you. If you upload pictures from your phone onto a PC and are sideways they will stay sideways even you rotate them after. You have to save them upright before you do anything else or open with paint, turn them and save. 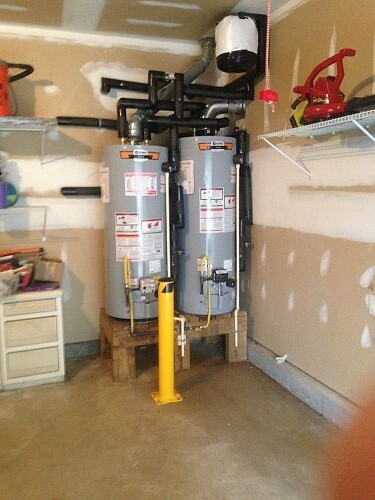 if they are both 50 gal appollo heaters why is one taller than the other, and if they run independent of each other what does balancing the piping have anything todo with the install? if the same heater why are the front controls different? Different codes for different states. No combustible material within 6” of a conventional vent. Think I saw a few others that wouldn’t pass here. But nice looking work! One is a direct vent, on a standard vent, I assume the height difference is the plenum at top and or bottom for the combustion air. The one on the right is the direct vent, penetrating the right exterior wall of the garage. The other one simply wouldn't reach, and the builder/plumber put them that way rather than both along the right wall, presumably for more car space I guess. The side taps on the heater, feeds heated water to the air handler of the hvac system, and then back again, resulting in a net zero pressure gain or loss. Each of these heaters fed a different air handler, one in first floor, one for second. When hot water is run from a faucet, there will be cold water coming into the heater/s. In this case, and the reason for the original call, the piping was installed in series, with the right heater taking nearly all the work of heating the cold water since it went in there first, then hot water from the right heater fed the left heater. So the right one failed, and the left one was functioning, but was nearing the end of it's life. So the (domestic) inlet and outlet piping, needs to be as close as possible, so when a hot tap is opened, both heaters are working equally to heat up the water. Not to mention, the tempering valve had to be put in there with a cold inlet, a hot inlet, and the hot supply to the house. So things had to be planned so that the cold feed to the tempering valve didn't interfere with the balanced cold run to the heaters. And likewise, the balanced hot coming from the heaters, had to get back to the hot inlet of the tempering valve. And of course, the piping off the heaters had to be copper or brass for 18in for code. I have no idea why the front controls are different, both were gotten at Furguson, since we don't stock "Apollos" at our shop anymore. skoronesa, ShtRnsdownhill and MASTRPLUMB like this. I want to thank you for insulating everything. I have no idea why the front controls are different, both were gotten at Ferguson, since we don't stock "Apollos" at our shop anymore. one was made to the old style standards and the other one to to the new standards, plus one is regular vent and the other direct vent !